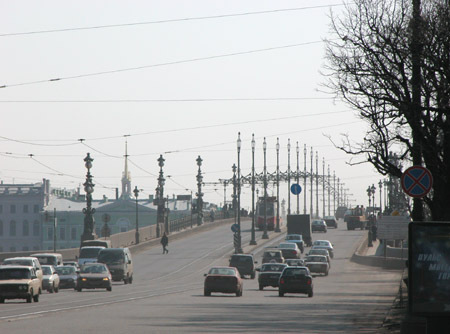 A short time ago Troitskiy (Trinity) bridge, also known as Kirovsky, has been opened after repairs and reconstruction. So now it's the best time for taking photos while it looks like just constructed. 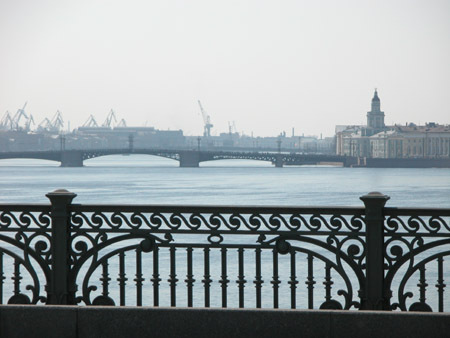 The bridge connects Kamennoostrovskiy, former Kirovsky, prospect and Troitskaya, former Revolution, square with Suvorov square located nearby Mars field. 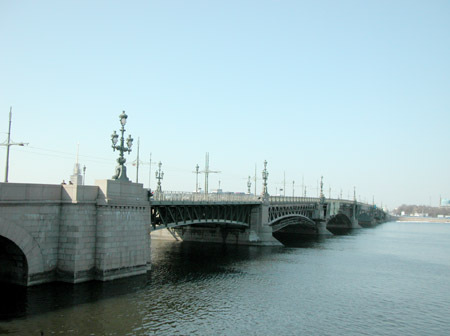 The bridge was consequently called as: Peterburgskiy, Suvorovskiy, Troitskiy, Ravenstva (Equality) since 1917, Kirovskiy since 1934, and Troitskiy again. Bridge length - 582 metres. 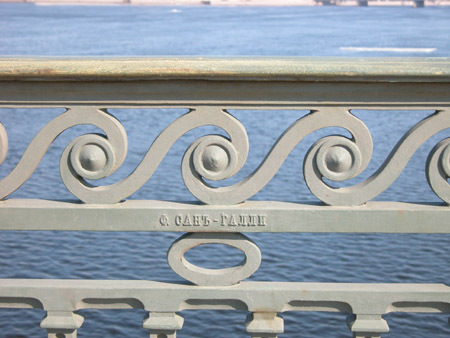 It was the longest bridge over Neva before the construction of Alexander Nevskiy bridge. 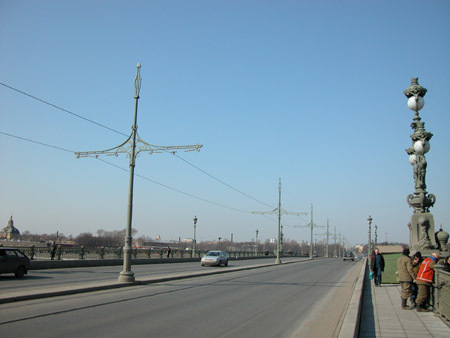 Width of Troitskiy bridge - 23.6 metres. 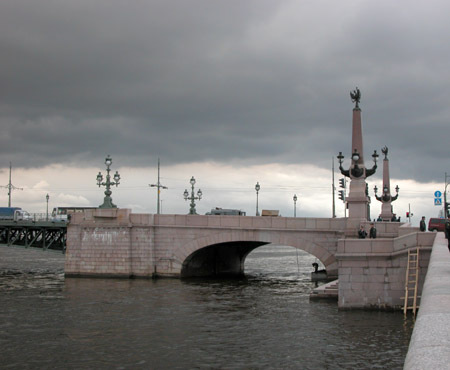 In 1803 here was Voskresenskiy (Resurrection), or Peterburgskiy pontoon bridge. 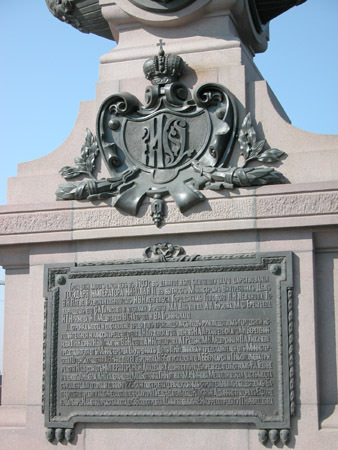 Earlier, since 1786, it was in another place - near present Chernyshevskiy prospect, called Voskresenskiy that time. 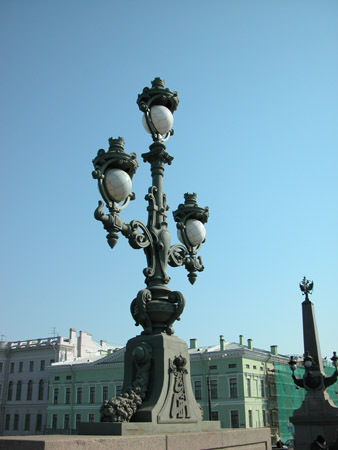 In 1825 after the creation of Suvorov square, it has been connected to Troitskaya square via Suvorovskiy bridge, also a pontoon one (little by little it has been getting the name of Troitskiy), but that time lantern posts were standing at the sides, and the bridge had cast-iron lattices. Lantern posts were probably restored later, after the permanent bridge construction. 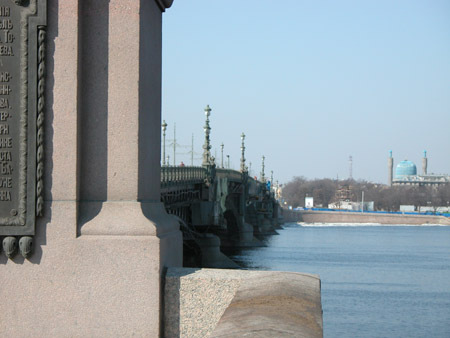 An international contest for the project of the permanent bridge has been announced in 1892. The project of Gustave Eifel - author of the worldwide known tower - has been awarded with the 1st prize in amount of 6000 roubles, among sixteen projects. In 1896 a second contest has been announced. Having only three projects, it has been won by architects V.Chabrol and G.Patouliar of the French firm "Construction Company Batiniol". Being represented during the first contest yet, their project didn't participate that time due to formal reasons. The project was supplemented by Russian engineers and architects. For instance, the author of the stone pier is G.G.Krivoshein. In 1965-1967 the drawspan has been reconstructed. Previously it turned at 90 degrees on rollers opening two passageways for vessels, 23 metres wide each. After the reconstruction it became a single-winged lifting span 43 metres long, looking similar to the rest non-lifting ones. The granit arch has been made at the left side - the same as the one had already been at the right side. Moreover, the slopes to the water have been broadened and granit benches have been made. 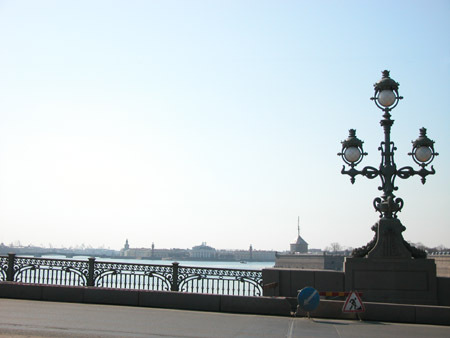 View to the spit of Vasilyevskiy island with the Stock Exchange building (by the way, it's completely repaired now) and Rostral columns. 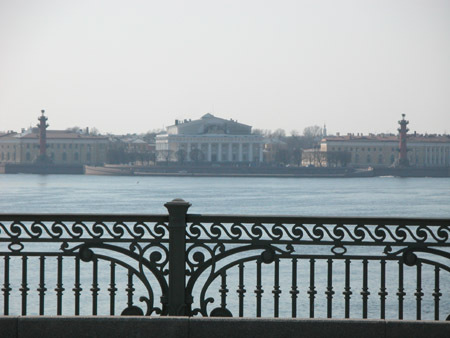 View to Dvortsovyi (Palace) bridge and Kunstkamera on the right. These small inscriptions were also reconstructed during the recent repair. 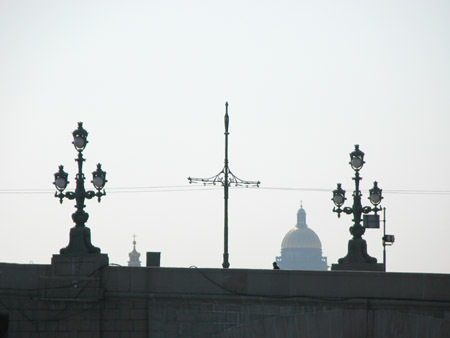 Lanterns and Isaac Cathedral dome. 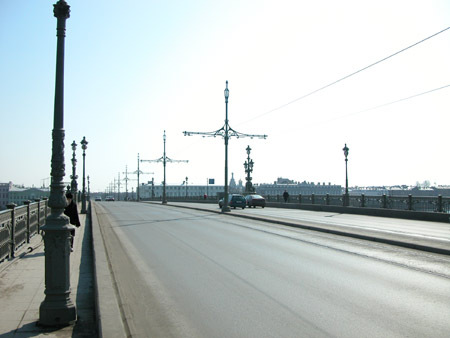 Despite currently popular elimination of tram lines in the city, the one passing over Troitskiy bridge has been left and reconstructed following modern requirements. The rails are put at the surface level without using sleepers. Almost invisible except the small edge borders. However, the figured pylons standing along the bridge center line were a little bit shorter before repairs. Exactly the spires were less stretched. 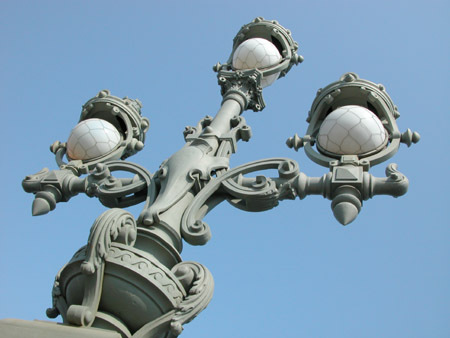 There are two types of posts on the bridge: having one or three lamps. As it's written in the source, the sphere at the top is larger in order to look equal to the others. 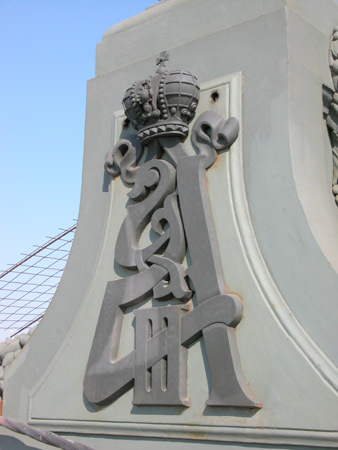 The monogram at the post base means "Alexander III" - the bridge construction has been started during his reign. Alexander the Third and president of France F.For have participated in the foundation stone laying ceremony. 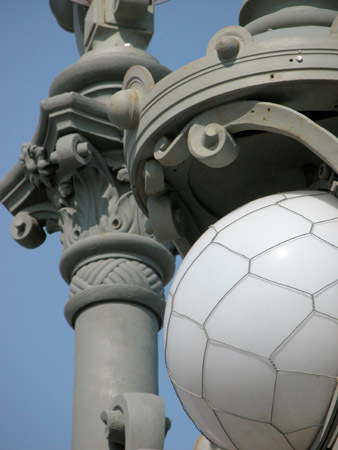 This picture shows that the lamp segments are imitated with interlaced wires. Possibly, the goal is safety in case of lamp glass breaking. 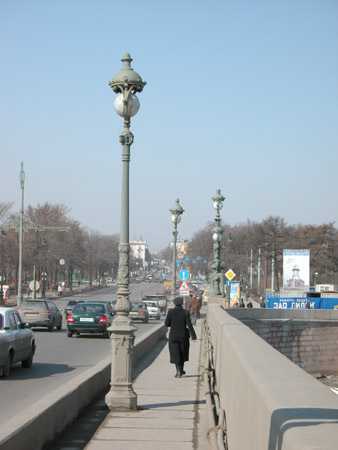 Another view to Dvortsovyi bridge. Pay attention that the lattice pattern here along the drawspan differs from other ones. 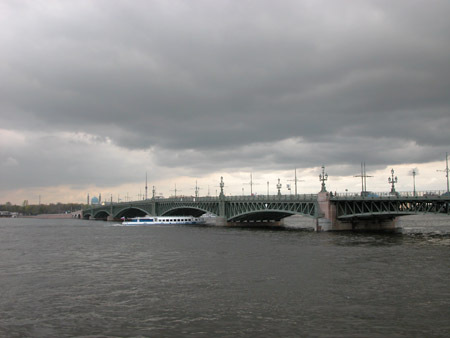 Let me make an insertion here - Troitskiy bridge in cloudy weather. Suvorov square and Mars field are on the right. 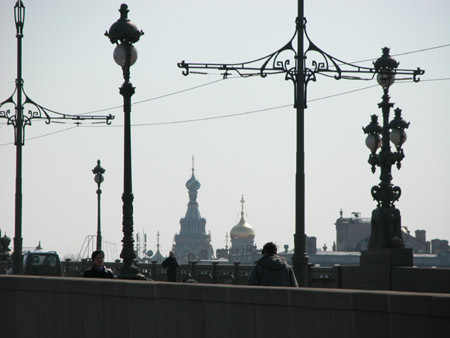 The glittering dome protruding on the right of the mosque belongs to just erected chapel, apparently in commemoration of Troitskaya (Trinity) church that has been standing on Troitskaya square in former times. It's simply out of place there, especially with such a smooth dome having no joints and thus even more striking. 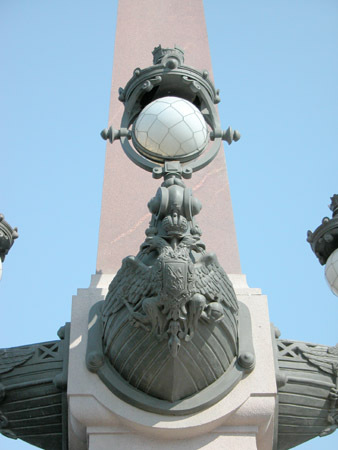 These two column-obelisks are standing at the bridge entrance of Mars field (Suvorov square) side. They resemble the Rostral columns. 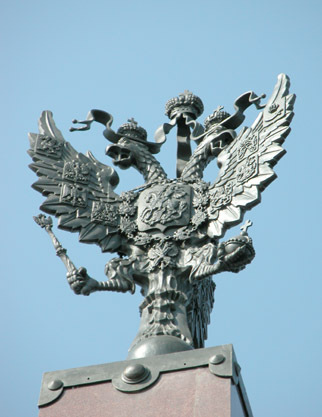 Royal eagles in Soviet time were replaced with five-pointed stars. Today both birds are returned back. 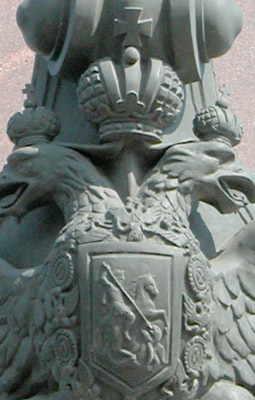 Also the monograms of empress Maria Fyodorovna (at the right picture) and Alexander III (mentioned above), text framing and the crowns above it were restored. 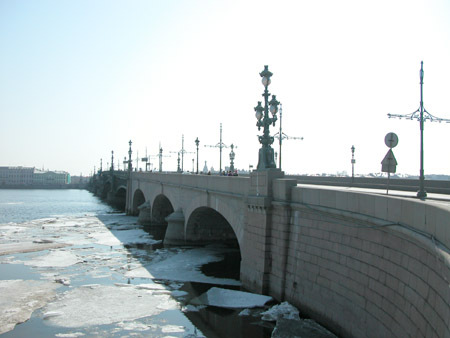 "Troitskiy bridge has been finished in 1903 during the ninth year of successful reign of HIS MAJESTY EMPEROR NIKOLAY II, during the authorities of V.K.Pleve as Minister for Internal Affairs, N.V.Kleygels as city Governor, P.I.Lelyanov as City Head, S.A.Tarasov as Deputy Head, and the members of the city council M.A.Anichkov, A.A.Buzov, M.F.Eremyev, I.T.Kryukov, I.P.Medvedev, V.S.Petrov, V.A.Troynitskiy. The bridge construction and working-out were carried out under the leadership of the city executive committee having A.I.Glukhovskiy as chairman and members N.A.Arkhangelskiy, A.N.Veretennikov, P.N.Kazin, N.V.Klimenko, F.B.Nagel, A.I.Kovsharov, A.G.Redko, M.F.Andersin and P.A.Likhachyov, representative of the Ministry for Internal Affairs L.I.Novikov, and representatives of the Ministry for Means of Communication L.F.Nikolai, F.G.Zbrozhen, N.B.Boguslavskiy, A.B.Berngars and G.N.Solovyov with the participation of the Committee from IMPERIAL Arts Academy under the presidence of R.A.Gedike and members L.N.Benua, A.N.Pomerantsev, M.P.Botkin, G.I.Kotov and M.A.Chizhov. The metal part of the bridge with stone piers 225 sazhens long has been constructed under its own project by French construction company "Batiniol" having U.Gouznui as president, E.Fouke and L.Galiare as Administrators. The stone part of the bridge 38 s. long has been constructed by A.Simonov and E.Knorre under the project of G.G.Krivoshein". 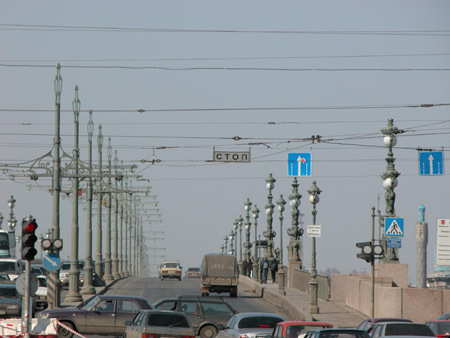 Pulkovo meridian runs along the axis of Troitskiy bridge. 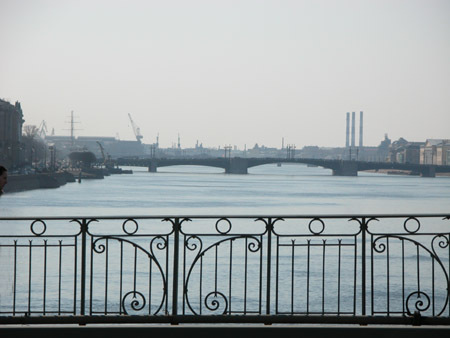 View of the bridge from Suvorov square. 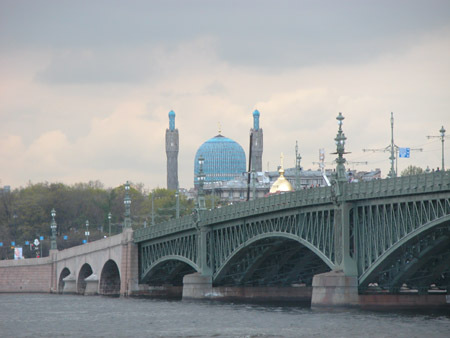 Finally, let's have a farewell look at the other side of Neva with the mosque from the previous album.